Anyone Interested in a #45 Shin Dig?? A while ago, two of our '73ers, Beth G. & Peter N. had expressed interest in serving on a #45 reunion committe if additional alumn were on-board to participate. Even though we are nearing the end of March, something could still be put together for later in the year. Cerrtainly this does not have to be a extravagant or expensive event - - picking a restaurant, an event, (or just playing crouqet & throwing horseshoes) in the middle of Doctor's park. (well, perhaps not). We already have enjoyed abundant "in-house" entertainment from ranks at previous get-togethers. In one of the northern Chicago burbs, I am aware of another #45 year reunion committee working on an event for their alumni. Their event is scheduled for October and will be held at a area restaurant where a cash bar & "heavy" appetizers will be served. All but 2 of their committee members are coordinating this from outside the Chicago area and things are moving along quite well for them. If you have interest in seeing a #45 for us and would like to be a committee "enabler," please drop Rick or me a note here, and we will be sure to put you in touch with Beth & Pete and to promote any planned event (to the max) here & on Facebook. "The Way We Were - Before We Were??" As a nostalgia junkie, I loved perusing the Whitefish Bay Library's North Shore picture collection (early 1900's) of Whitefish Bay & the eastern slice of Glendale that borders Lydell Ave on the west side with WFB on the east. 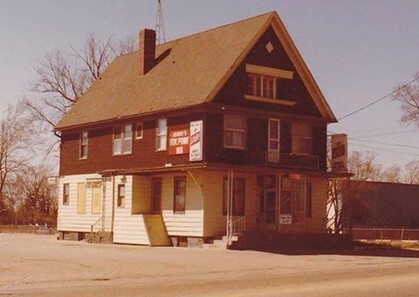 There were pictures of the WFB building (where Winkies is now) on the corner of Silver Spring Dr. & Marlborough Drive (did Marlborough exist in the early 1900's??) - with photos of sparse homes/open land along Shoreland, Bay Ridge, and Kent avenues in WFB, and the area where the Milwaukee Gear Little League park stands now. Our classmate, Beth Dallman Veldbloom shared historic pictures of her grandfather's barn on Green Bay Ave., as well as pictures from the Glendale Fire Dept. that her dad was active in as a supporter/volunteer. 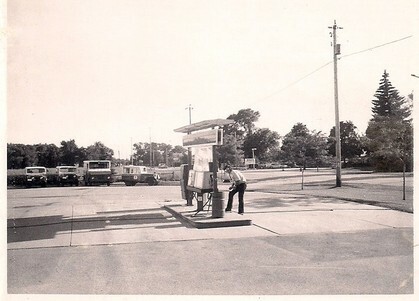 intersection, the gas station & the year it was taken? has proliferated . . .
Picture below - - (a bit older??) with a blacksmith shop. Head a few blocks south, but don't go under the railroad trestle. NW corner of Port Washington & Green Tree. school hot lunch program fare. while enjoying alternative dining accommodations! and a few jerkies & slim Jim's on the side. I won't mention this person's name - - - Michael Reck. got almost as many tourists as the Domes! Some of the featured pictures here derive from this group. Of course, these include contributions from our very own. 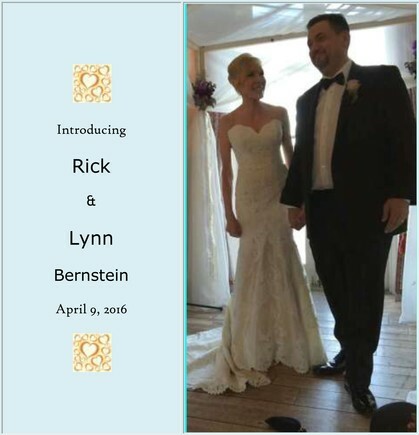 newly-wed Rick Bernstein - - - "AMAZING"! yet had the pleasure of viewing? 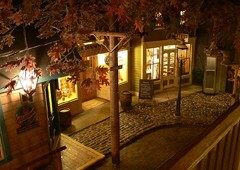 "The Streets of Old Milwaukee"
! ! ! E-X-P-A-N-D-E-D ! ! ! 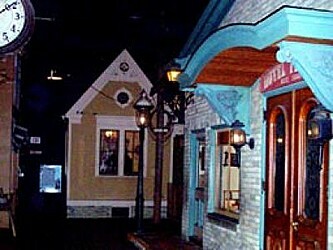 A while back, we chatted about this beloved exhibit "institution at the Milwaukee Public Museum. As a slam-dunk "no-brainer," many of us '73 alumns possess a true soft spot for this local treasure and the cobblestone streets. Last week, the Museum reopened this exhibit wing & you can actually do a virtual tour by dowloading a app! For starters, you may want to check out photos of the latest additions. 1. Yes, that lovely grandma is still on rocking chair duty on her creaky front porch. 2. No, the Knightskellar does not appear in this exhibit. 3. No, the "C-5" door with the upside-down doorknob & and plaster-paris statues of the "Bathroom monitors" don't either. 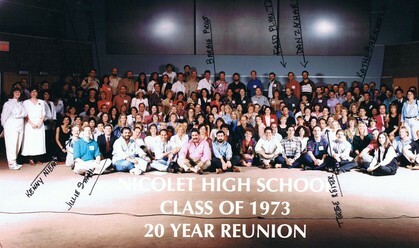 Over 21 years ago we celebrated our 20th Year Reunion! Travelers - Down the Road ... NOT over The Hill !! but now comes Round #2! 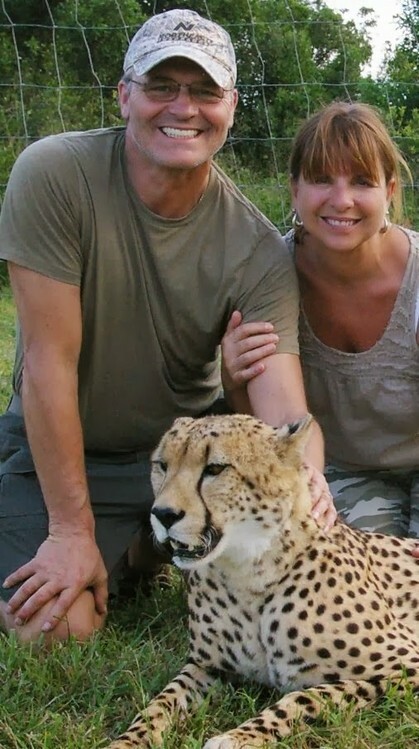 Safe Travels Cindy & Roy! Can't wait to read your updates! Wow to the Class of 73! to celebrate 40 years since we graduated! seen for decades in some cases! with the comments we received. You had a blast and that was our goal! PLEASE upload to facebook and/or youtube.com. Remember the Sydney Hih Building? Who amongst our ranks can honestly say they never heard of the Sydney Hih Building? This was the "psychadelic" antique building cluster on the NW corner of 3rd & Juneau - straddling the north downtown Milwaukee perimeter. Remember Betty's Bead Shop? 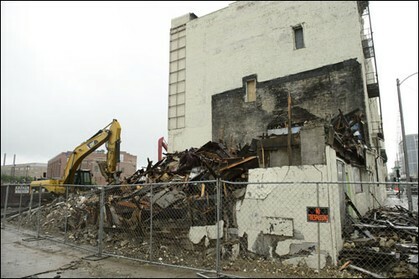 Undoubtedly, those of you that follow Milwaukee news - and/or continue to "hold the fort" locally have been following the debate with the complex's last owner (Milwaukee Economic Development Commission) whether to preserve as a historical building - or cede to the wrecking ball. The wrecking ball prevailed - BUT our own John Engel was able to predict this during our senior year (and for that matter - Lee Levin too). 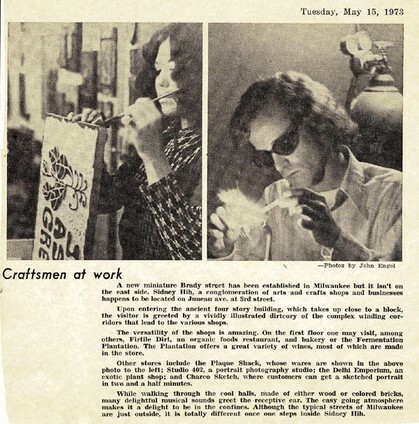 John was kind enough to share this old Knights Page article (1973) that was a Lee & John collaboration (Lee writing the article & John providing the photos). Those Hillarious TV Celebrity Roasts from the 60's & 70's. Some of the funniest clips on the internet are from the old Friars Club Celebrity Roasts from the late 1960's (prior to the great Dean Martin roasts from the 1970's. Many of you know (especially Jed), that I am a huge Jack Benny enthusiast ... When Jed's "The Sounds of Yesterday" was heard on Milwaukee & Wisconsin Public Radio in the 1980's & early 90's, he always played a generous compilation of Jack Benny radio broadcasts & recordings from his own collection. 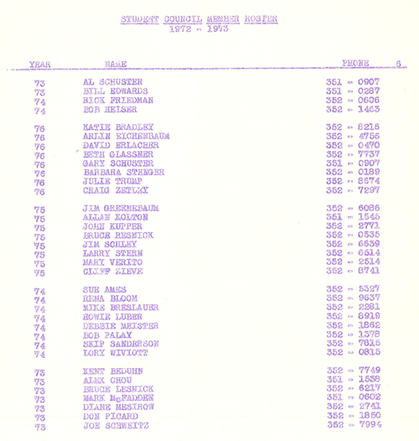 This artcile on Jed (8/21/87) was when Jed was broadcasting his show from the WYMS studios. (can't link to it) entitled "Gurda did it Again." 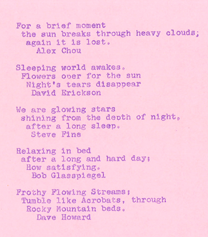 on his column (4/1/12) regarding the history & preservation of the Red Star Yeast Factory. (how many of you remember that sweet aroma off of I-94 & 27th street?). The author of the letter was Jim Reiels of Land of Lakes. While 2012 was a rough launch for us losing, Steve, Thorpe & "Mr. J.,"
(and possibly the next reunion). and a question . . .
Time has been gliding along since our 7/23/10 update below. The weather has been quite tranquil with abundant 70 & 80 degree weather. Due to severe July flooding, our alma mater began approx. 1-1/2 weeks late, but with a fabulous school-wide facelift. The good news is that most of the $3 million loss will be covered by insurance. Rick a couple of scans to share from our senior year. Alex's second scan is the Student Council roster. Several more of you will recognize yourselves, as I do myself. We worked pro-actively on such issues as 1) Edible hot lunch food faire, 2) creating the "smoking lounges", 4) the renaming of Frontage Road to "Jean Nicolet Road, 5) Open Campus parameters and more . . . Given the severe bare-bone budget cuts that most school boards wrestle with each year, isn't it a stitch that the school board budgeted for bathroom monitors to ensure a smoke-free experience? Was this the heyday of "pork barrel spending?" Remember the "University of Lawsonomy?" Friday night, I was returning to Milwaukee with my son who was having a short semester break. Driving in the wee morning hours can tap old memories, and one of them was the old lit-up sign for the University of Lawsonomy on I-94 south of Milwaukee. As we neared the the Kenosha/Racine county divider (Cty. KR) coming north, I started to look for the lit-up sign unsuccessfully. It's not like I haven't traveled this road frequently, but now the curiosity to spot it. For the record, the "University of Lawsonomy" comprises a sign with a customized anemoneter on a plot of manicured sodding. There are also some dilapitated farm buildings on the property that were intended to become campus structures. Its specific location is on the east side of I-94, between the Cty. KR (south) and Hwy. 11 (north). 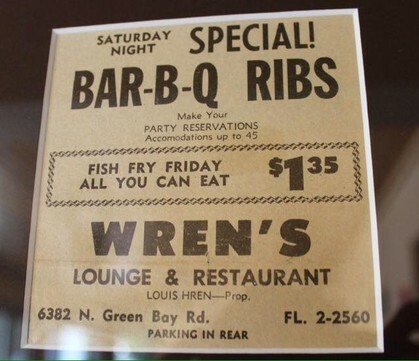 Do any of you know if the sign still exists? I have been passing this location at nighttime. And who were the "alumni" that attended a 2002 reunion? THANKS ALEX for the sending the scans to us! E-mail us - our update frequency is "100% Content-Driven." drowns in Torrential Rainfall. Nicolet hard hit. We could not get our of our parking lot for over three hours because of the high water on Port Washington Rd. rushing southward towards the Port/Bender interestion (and that underpass was blocked from high water too). Many portions of Santa Monica Blvd. in Fox Point were overtaken by the water in the center culverts rushing northward to Indian Creek. A car actually got swept into the culvert by the Town Club on Santa Monica Blvd. and Bradley Rd. Wth the major widening project that Fox Point completed recently, the creek was bankfull throughout the Indian Creek Parkway corridor. Fred is now in a place where he is at peace. I send my thoughts, love and prayers to all of his friends and family that mourn his passing. I am terribly sorry to hear of Fred's passing. I had the privilege of knowing him from sixth grade through Nicolet. He was always polite, considerate, sweet and dignified. He also had pockets of phenomenal intelligence. I hope he found the happiness he so richly deserved. I just wanted to take a few moments to express my sadness and give my condolences to literally a "one of a kind guy", Fred Greifenhagen. I don't know if it was just me and or a few other chosen people, but from time to time he would call me and talk to me - or for that matter whomever happened to pick up the phone; my wife or daughter, and simply speak his mind. He called me for advice on "car buying possibilities" as he knew my brother-in-law is in the car business. I gave him whatever info. he needed to help him out. Hopefully it worked out. In addition, he liked to talk politics . He wasn't happy with the current state of the job outlook in the Milwaukee community (Gee I wonder why!) I also tried to steer him in the right direction for job possibilties. With that in mind, it was easy to tell and he admitted being a "concerned Conservative"; always trying to better himself and not necessarily looking for any "handouts." We are saddened to learn that Fred passed away on Monday. He was 57 yrs. old. As we grieve for all of classmates that have left us, we can all relate how he was special to all of us. Given his challenges that he had growing up and into his adulthood, I can never remember when he did not have a smile on his face or any hint of bitterness. Given his own limited financial resources, he was generous, cared about people and was always optimistic. While he had a different learning style with Asperger Syndrome, he was brilliant in many ways. I remember him being in a introductory accounting class at UWM (the type of class that many people could take 2,3 or 4 times to pass) that Freddie breezed through with a high "B+" grade. If you didn't see Freddie for months or several years at a time, it didn't matter, because he would greet you like you left a conversation from the day before . . . .
Are You Still Getting Our E-mails? Pam W/O., and Jim W.
If you are one of the above (or are in touch, please let them know - - Thanks! SPECIAL THANKS to JOAN PASTENE DENNIS for the HEADS UP! For those of you who know, or have followed Barb and her diverse background in teaching, coaching and parental advocation, now - we have a opportunity to help Barb get her own talk show (Barb Says) on the new Oprah Winfrey Network. Good luck Barb - - - we're pulling for you! Thank you again Joan for the heads up! Recently, I have been on-premise in E-Wing and for those of you who had Choir, Concert Band, Orchestra, or Drama, you would see that things are pretty much like the E-Wing that you would remember. They did build an adjoining room between the band/orchestra and choir room that holds the huge musical library and some nice enhancements in the auditorium corridor. When I was working there, I was delighted to run into Mr. Rick Young between classes. He is the last remaining faculty member from our tennure teaching there - - and still going very strong with English and Creative Writing. I recall when he was our Forensics Coach and how strong a team we had under his tutelage - - carried over from "Coach" Ruth Way. I remember that he told us in class about a time in college when he was working at the campus radio station and somebody threw a pig in the studio as a prank. Prior to Mr. Young coming to Nicolet, many of you may remember an English teach named Ron Ernst who was also the Debate coach and accompanied the Forensics team to some of our competitions. Mr. Ernst also was a great teacher and lot of fun to learn from. Would you believe that he has an identical twin brother named Roger who taught English in the Neenah/Menasha School District. When I say identical, they were identical in the way they talked, mannerisms, everything. And they did pull a brief brank where they switched and did fool some of us at a match. It's been a little quiet around the website here and hopefully we can get some activity moving again. So allow me to start out with some news . . . 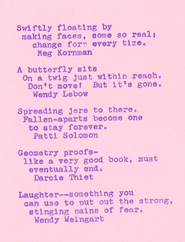 If you see it, please let me know what you think (good, bad, or indifferent). For many of you that have not been back to the North Shore and around Nicolet (in particular), you may be a bit surprised to know that the City of Glendale and Nicolet School Board are suing the Village of River Hills over the intersection of Green Tree and Jean Nicolet Roads. There was a pedestrian that got struck and killed on Green Tree (just inside River Hills) and complaints about the traffic and speeders. The reason is that River Hills authorized the eastbound closure of Green Tree Road that would block off a direct route to Nicolet and across the I-43 bridge to N. Port Washington Road. Thanks for reading - - do stay in touch with us when you have a chance! 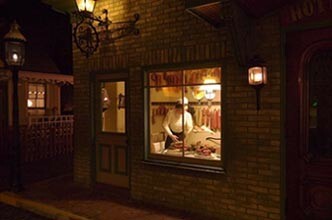 The Streets of Old Milwaukee - Updated! I tweaked and added a few more photos (please see 11/2/09 post below), including the website link for the Milwaukee Public Museum info. on this beloved exhibit. Peter Newberger recalls that his grandfather - a pharmacist for 50 years, contributed various items for the exhibit drug store. For the record, his grandfather operated 3 drug stores in the Milwaukee area - - - 38th & Villard, Walnut St. and Farwell Avenue on the east side of town complete with a old fashioned soda fountain! Peter also reports that today's celebrity birthday includes Peter Noone of Hermans Hermits. He is 62 - still looks and sounds great. He had the pleasure of meeting Peter at the new Fallsview Casino in Niagara Falls, Ontario - - just a short 30- 40 min. ride from their house. Thanks for both Peter! 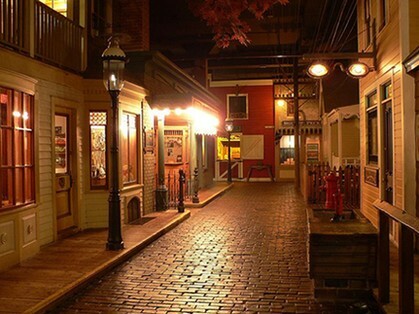 The Streets of Old Milwaukee! This has got to be the all time-hit for many of us that would visit the museum! As you may recall the exhibit was established in 1965 with donated cobblestones from the old streets, artifacts from older buildings - homes, storefronts, etc. Remember "grandma" that would greet you as began your walk down the street at the first corner? 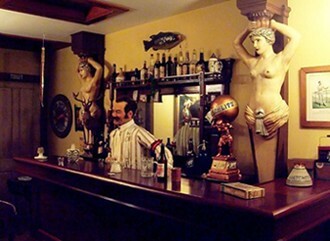 The was actually a working "silent movie theater" and the modern "pharmacy" from the late 1800's/early 1900's. Check that lady cutting the sausages in the first photo - - - does that bring back any memories from the old Gimbels-Schusters? (at least the Tastee Town fountain maybe). Enjoy the photos! Want some more information and more pictures?? 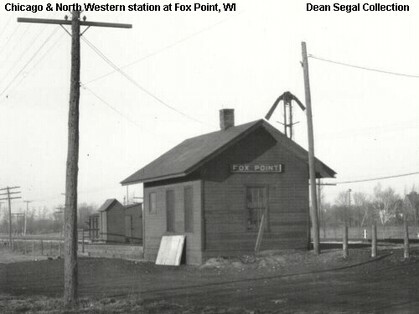 This photo is from a compilation of historic Chicago and Northwestern train stations that follow the routes from Milwaukee throughout Wisconsin. Assuming this is the same RR right-of-way as the present, one would wonder where this station was. Could it be Green Tree or Dean Road? Or how about any of the in-between streets - - - Bradley, Calumet, Bell Road or maybe in someone's backyard that later lived on Santa Monica Blvd. or Boyd Way? Milwaukee Public Library - Remember When. 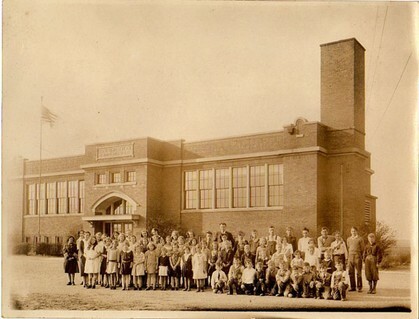 Do you have any historical photos from the North Shore or Milwaukee? We'd love to post them! 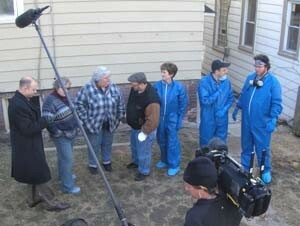 HOARDERS set a adult demo ratings record! The Monday evening program (8/17/09 - 10/9C) was watched by 2.5 million viewers – including 1.8 million adults (18-49) – making this A&E’s most-viewed season premier ever. We had about 125 persons at the premier show party at the Bavarian, including Mr. Bernstein himself (thanks for coming Rick!). You can see me shoveling up a rotted pumpkin into a garbage can and in a "briefing" by Dr. Tolin, similar to the photo (below right). There is also a dramatic (almost) throw-up scene too with Brenden McDaniel, my boss/owner. Brenden is also featured in the new 8/31/09 (Monday) that was filmed in Torrance, CA. If the ratings continue to do well, then there is a possibility that the network may order additional episodes. If you have a chance to view the show, drop me an e-mail and let me know what you think! A Special Announcement - Making My "Debut"
For those of you that live in, or within driving distance to Milwaukee, you are cordially invited to a Premier Viewing Party on Monday, August 17, 2009 (7-11 p.m.) at the Bavarian Inn (Glendale, WI). The event is sponsored by local businesses that both Brenden and I know through our chamber or other networking groups. If you would like to attend, please e-mail/RSVP to Karin Conway (KMC Marketing) – no charge. We would be honoredto have you join us to celebrate this very special event that is being graciously hosted by the business sponsors listed below - - - and if the TV ratings are great - - - who knows what will be next?? on this 20th century artifact. including several Knight's Pages scans! 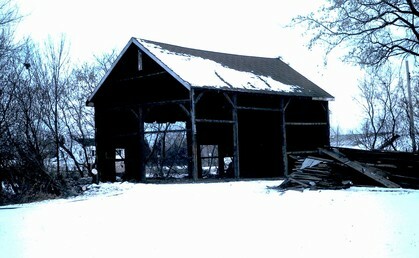 The big barn across the street (photo below - left side of old Green Bay Rd.) 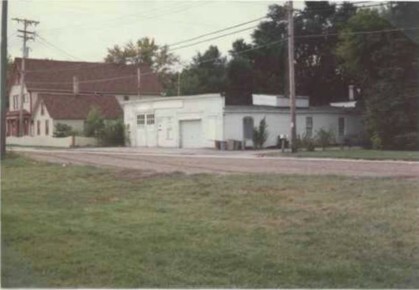 had been removed; but the smaller one (facing north & south - photo above) on the same property was still standing during the 70's. Dad removed the house, barn & other out buildings on his homestead May of 1975. 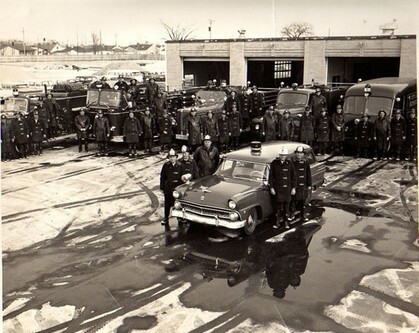 I have his pictures of that event, including the Glendale Fire Dept. "fire practice" prior to the destruction. Heading south on Green Bay (from Good Hope Rd. ), one block north of Edward Lane is Bernard Lane (only goes west - across the street from the house I grew up in). Check out the first driveway south of Bernard on the west side of Green Bay. There you will see the original farm house from your 1900 photo; the one with all the barns. 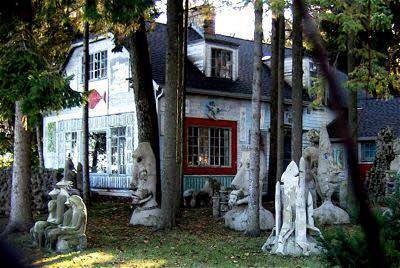 I guess the house is still there, but the barns appear (on google maps - street view) to have been removed. As shared, Beth's father was a longtime supporter and volunteer for the Glendale Fire Department. THANK YOU Beth for sharing these precious photos! A few postings below this one (5/31/09), we posted a historical photo (circa 1900) and solicited your guesses as to the Glendale location. 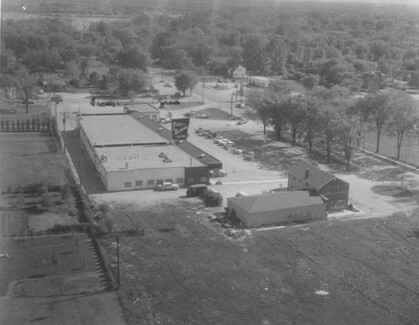 Not only did we get the correct answer from Beth Dallmann Veldbloom (now the intersection of Green Bay Ave./Green Tree Road) but learned that the land to the north was owned by her Grandfather and parents! 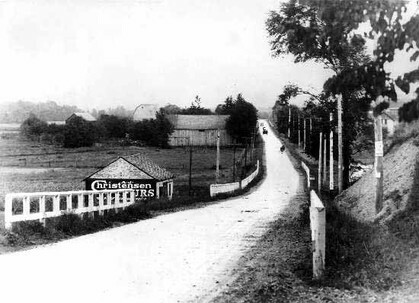 The house on the right (below) was where my father was born (1923). My grandparents originally owned the land just north, and almost back to the Milwaukee River. They sold most of the farm, and thus were the homes built directly across the street from Congregation Beth Israel. My parents built their home directly north of the original farmhouse. I believe the "old tomato farmer" was the last working farm in Glendale. I used to be embarrassed by it, but have become proud that my father (with a good education) was able to serve his community well. He did so much for/with the Glendale Fire Dept. and was President of the Glendale Water Commission. 1930 - Neighborhood gathering at the pond on Green Tree (including the Prange family). The Prange farm was on Good Hope Road; although they had Greenhouses, and my memory says they didn't really produce a crop. The photo of the neighborhood gathering (1930) was taken at a pond which is located on the north side of Green Tree Road, about 3/4 of a block east of Green Bay. (Currently there are either apartments or condos on the site, named (I believe) Glendale Lake. The Pranges included in the photo are: Bill - row 2, 4th from the right and Amanda front row, center (6) in the white dress. 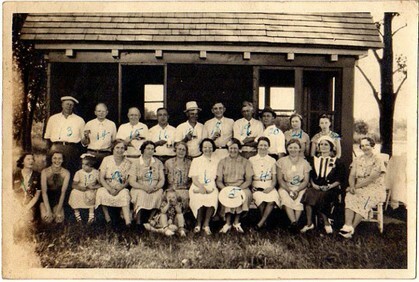 My grandparents: Walter Dallmann is behind Amanda (sporting the tall white hat) and Olga - front row, third from the right. I do have all the names for the photo, but do not believe they would be familiar to you or others. I vaguely remember only a few myself!! I would be quite surprised if any of them are still with us; as they would have to be in their late 90's or older. The reason I'm writing is sad. Our classmate Paul Egner is doing very poorly. 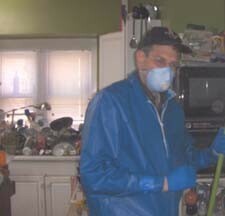 He has had Parkinson's disease for about eight years or so and now complications are getting the better of him. I just wanted to give you a heads up so you can remember him in your thoughts and prayers. Let me know if you'd like contact information for Paul's family.